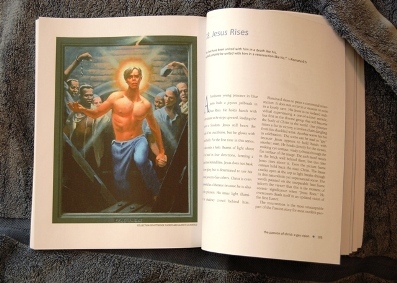 Jesus challenges viewers by arriving as a young gay man of today in a modern city with The Passion of Christ: A Gay Vision by Kittredge Cherry (author) and Douglas Blanchard (artist). The illustrated book brings together a gifted gay artist and an established lesbian author who specializes in LGBT Christian art. They take the most important narrative in Western culture and rescue it from fundamentalists and also from over-familiarity. Both are at the forefront of a trend towards envisioning Christ as queer. Each image is accompanied by an insightful essay on its meaning, artistic and historical context, Biblical basis and LGBT significance, plus a short meditation with a scripture and one-line prayer. The Passion is placed in a larger context in an introduction by the artist and an afterword by Toby Johnson, comparative religion scholar and author of Gay Spirituality. The book itself is a work of art with lavish full-color reproductions and an elegant design. The Passion of Christ (ISBN 194067140X) is published by the Apocryphile Press, a publisher and purveyor of fine books on religion, spirituality, philosophy and poetry since 2004. Based in Berkeley, Apocryphile has more than 100 titles in print by historical and contemporary authors.